I was born in Hawaii and spent my summers there as a kid, visiting my grandparents. 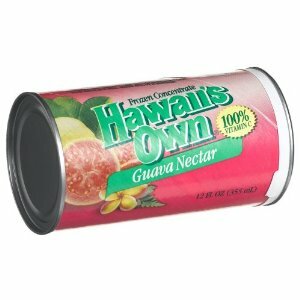 I've always loved guava juice. It's pink, it's sweet, it's refreshing; it's just yummy. Guava jam - pretty good. But in all my years I never had guava cake. Boy, was I missing out! I actually prefer the brand Hawaiian Sun but it's not available here in AZ. I found this brand at my local WinCo. If you can't find this where you are, don't despair. Thanks to the growing Hispanic population in the US, guava juice is more popular than it was in years past and you can sometimes find it in cans or bottles in the juice aisle. I know Kern's is a popular brand. Grease and flour cake pan(s). 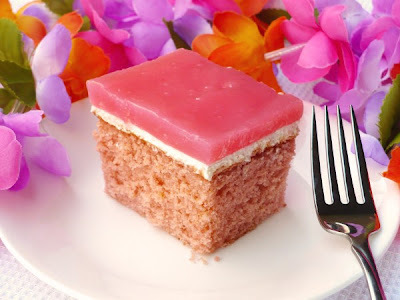 Bake cake mix according to package directions, substituting 1 1/3 cups guava juice for water (and add food coloring until cake mix is desired color, if using). Cool. Meanwhile, in a medium saucepan, bring 2 cups guava juice and 1/2 cup sugar to boil. Make a thin paste with cornstarch and a little bit of water. Remove guava juice from heat and whisk in the cornstarch mixture until completely smooth. Return to heat and boil for one minute. Stir in food coloring, if using. Cool glaze in refrigerator until at least room temp, about 30-45 min. (If it gets really thick, beat it vigorously with a whisk until smooth again). In a medium bowl, beat cream cheese with an electric mixer until fluffy. Add sugar and vanilla (and food coloring, if using) and beat until smooth. Fold in the Cool Whip. 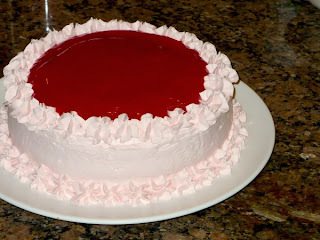 To assemble a 9x13: Spread cream cheese mixture evenly over cake. Repeat with guava glaze. Refrigerate until ready to serve. To assemble 2-layer round cake: Remove cakes from pans and level. Spread some topping on top of first cake and place second cake over. Thickly frost the cake with remaining topping, piping some of the topping around the edge of the top of the cake (this will hold the glaze in place). Spread glaze on top. Refrigerate until ready to serve. I am definitely going to make this cake sometime. Maybe I'll ask someone to make it for me for my birthday next month.